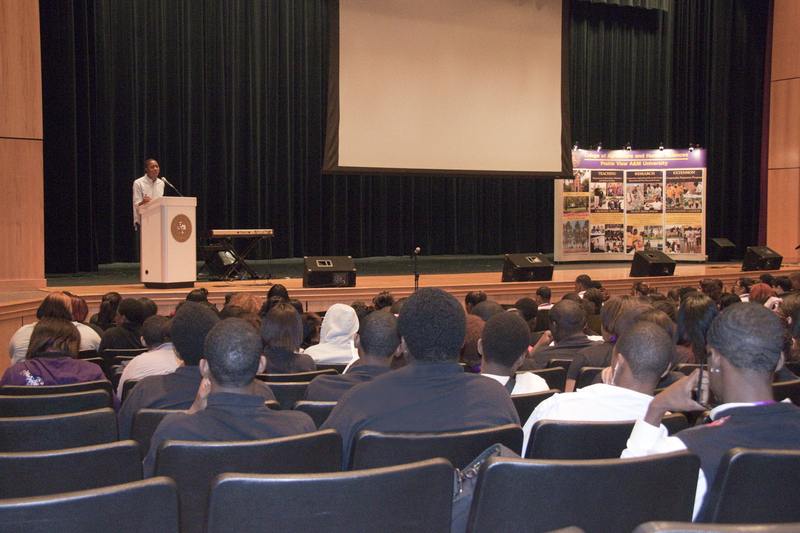 PRAIRIE VIEW, TX – A group of 275 middle and high school students from Houston and Beaumont, Texas who attended Prairie View A&M University’s College of Agriculture and Human Sciences High School Career Day found that fun and making good grades is achievable if you find the correct balance. The event took place on campus May 6and was part of the pre-Agricultural Field Day activities held May 7. Dr. Richard Griffin, interim assistant research director, Cooperative Agricultural Research Center,center, and Theo Reed, PVAMU freshman Agronomy major,second from right, share information about Prairie View A&M University with high school students. Pictured from left to right are students and the Graduation Coach from Worthing High School: Rodney Jackson, Mr. Zeno - graduation coach, Jazmine Tanner and Lamar Matthews. Andra Collins, a Prairie View A&M alum who majored in agriculture with an emphasis in Animal Science and is now an agriculture teacher at Eisenhower Middle School in the Aldine Independent School District, brought more than 20 students to the Career Day. Collins told the participants that her time spent as a student at Prairie View was very rewarding, and she wanted to go into teaching to expose more youth to the field of agriculture. Bobby J. Smith, II, PVAMU Student Government President and an agricultural economics major, emphasized to the young people that going to college is a wonderful experience if you know how to set your priorities and have balance. “It’s about balance and what you want to achieve,” said Smith. “I partied a lot at Prairie View, but I also maintained a 4.0 average.” Smith is graduating in May and will be attending graduate school at Cornell University in the fall. Bobby Smith, II, graduating senior, Agriculture, and president - PVAMU Student Government Association, tells high school students that it's all about balance. The participants also heard from other PVAMU agriculture and human science majors including Theo Reed, a freshman majoring in agronomy, who told them to choose their friends wisely and to not be afraid to ask other students for help. Reed also said that it’s very important to maintain a balance in your school work and social life while attending college. Excitement continued at the Career Day with a step show performance from the Omega Psi Phi Fraternity, Inc. and an engaging session from Dr. Wash A. Jones, assistant professor, who asked students some basic questions about agriculture. 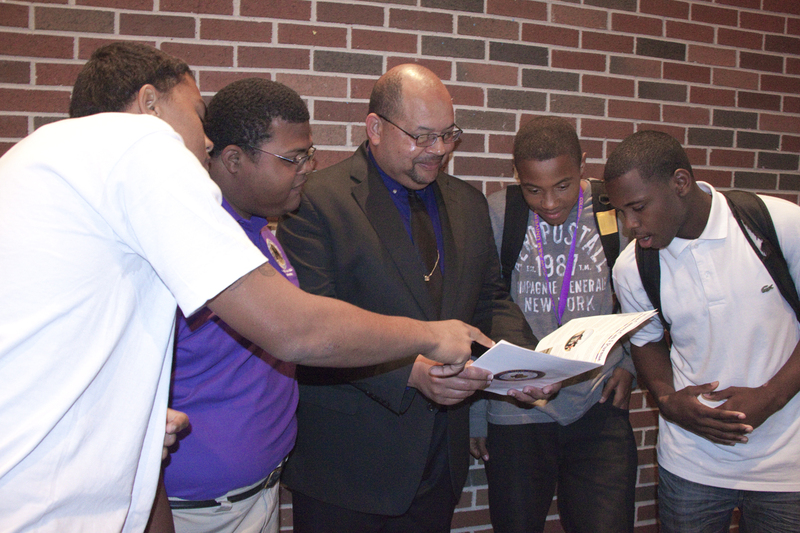 Mark Pearson, director for Enrollment Management, asked the young people, [why PVAMU?] and told them that he expected them to go to college and to do well. In addition to Eisenhower Middle School, students from Houston representing Worthing and Sterling high schools and Travis and Woodson middle schools attended the Career Day. 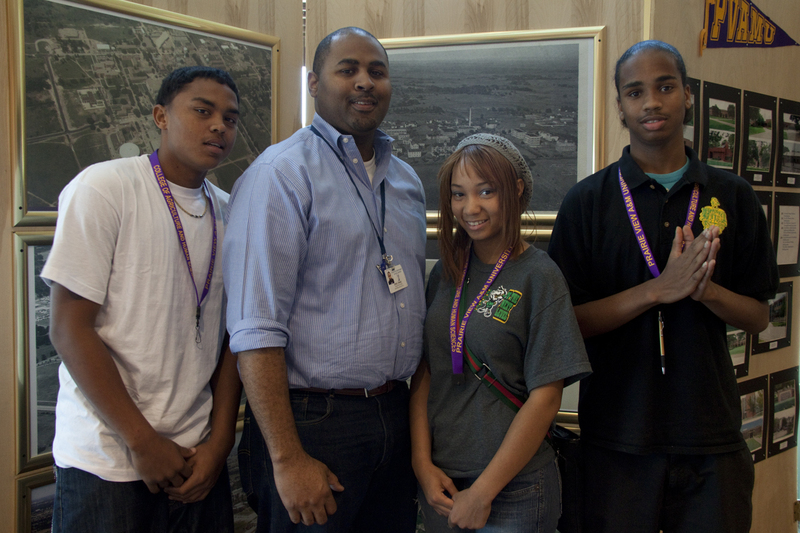 Young people from Central Medical Magnet High School in Beaumont, Texas also came to the Career Day. Dr. Victor G. Stanley, interim head, Department of Agriculture, Nutrition & Human Ecology, ended the Career Day with information on the types of majors and degrees available in the College of Agriculture and Human Sciences. For more information about the High School Career Day, contact Horace D. Hodge at 936/261-2521, hdhodge@pvamu.edu. This entry was posted on Thursday, May 12th, 2011 at 4:46 pm and is filed under 4-H & Youth Development, Agriculture and Natural Resources, General CEP News. You can follow any responses to this entry through the RSS 2.0 feed. You can leave a response, or trackback from your own site.